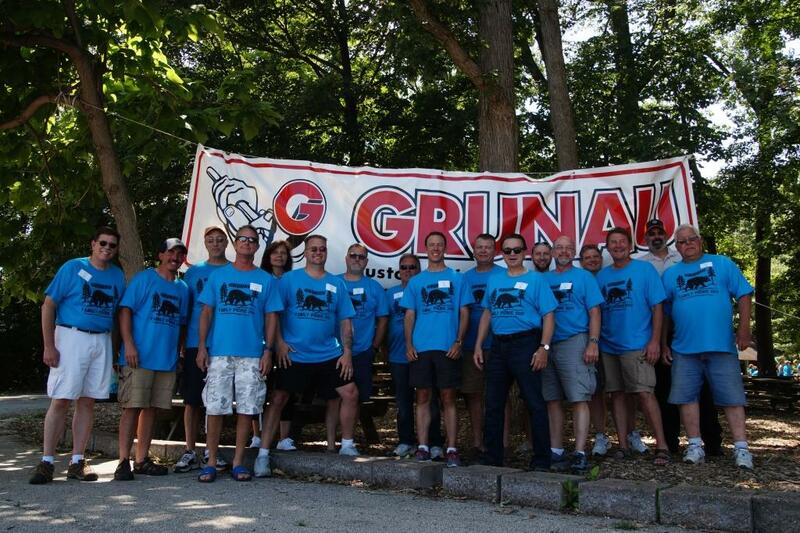 Grunau Celebrates Employees | Grunau Company, Inc.
Grunau Company celebrates long-term employees at our annual summer family picnic. This year the event took place on a sunny Saturday in late July at the Milwaukee County Zoo. With over 160 employees bringing their family members, there were nearly 590 people in our group. Decorations and activities centered around our picnic theme of “The North Woods”. We even had a bear screen-printed on the bright blue t-shirts we gave to each picnic attendee this year. The Zoo is a great picnic venue since people can enjoy food, special activities, and mingling with coworkers in the designated picnic area, then roam with family and friends around the zoo after they eat and watch the awards presentation. 2017 saw 52 employees receive service awards; while not everyone was able to attend the picnic, their names were still announced and recognized during the awards presentation. Grunau’s President, Bill Ball, announced the employees and shook each of their hands as he presented their award to them amongst lots of smiles. The group photo accompanying this article received service awards during our 2017 Grunau summer family picnic. Pictured L to R, front row: Jeff Hintze (25 yrs), Dave Risse (15 yrs), Greg Urlakis (30 yrs), Shane Schilcher (20 yrs), Bill Ball (President), Ted Angelo (40 yrs), Don Czajka (25 yrs), Tim Sadowske (35 yrs), and Sam Mack (30 yrs). Pictured L to R, back row: Mark Berger (30 yrs), Linda Smikowski (10 yrs), Brad Landry (10 yrs), Paul Davis (40 yrs; IN), Tim Kuhl (20 yrs), Drew Romanyak (20 yrs; PA), Bill Edwards (15 yrs; OH), and Joe Rice (15 yrs). Not pictured but who also received service awards in 2017 for their long-time dedication to Grunau Company include: 30 years = Bob Stich. 20 years = (FL): Leisa Hale, Greg Trammel; (OH): Jimmy Alberti; (WI): Ron Berger, Gary Bremer, Matt Eberhardy, John Flick, Craig Niermann, Curt Pronschinske. 15 years = (FL): Casey Harjo; (WI): Rich Deml, Josh Grube, Mike Zieman. 10 years = (FL): Travis Howard, Brad Meredith, George Miller, Del Robertson, Michael Thomas; (OH): Adam Wilkinson; (PA): Chad Mertz, Roger Powell; (WI): Blake Boegel, Tiffany Clark, Rich Daley, Chris Esser, Scott Jelden, Jeff Krzyzanowski, Kyle McCann, Ryan Mundigler, Steve Prodoehl, Nick Riordan, Jared Schaefer, Jim Seif, Matt Szymcak, Dan Wollenzien. The dedication of our employees to Grunau is truly amazing. We congratulate and thank each of them for taking care of our customers all these years!